I am a huge fan of crab cakes, salmon cakes and really any kind of cake. The only problem with this love of cake is that all cakes, even seafood cakes, typically mean lots of carbs. 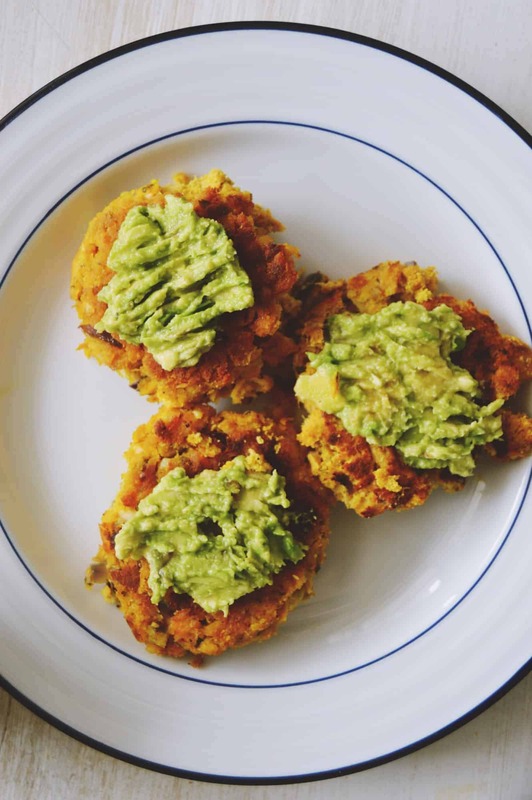 In the past, when I would have a craving for salmon cakes, I would have to just eat plain salmon or some makeshift version of a salmon cake that would instantly crumble when I took my first bite. Oh and forget ordering a salmon cake from a restaurant- those are sure to be loaded with breadcrumbs! What is one to do?!? 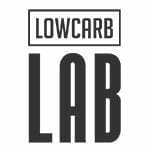 Develop a perfect low carb salmon cake recipe, that’s what. 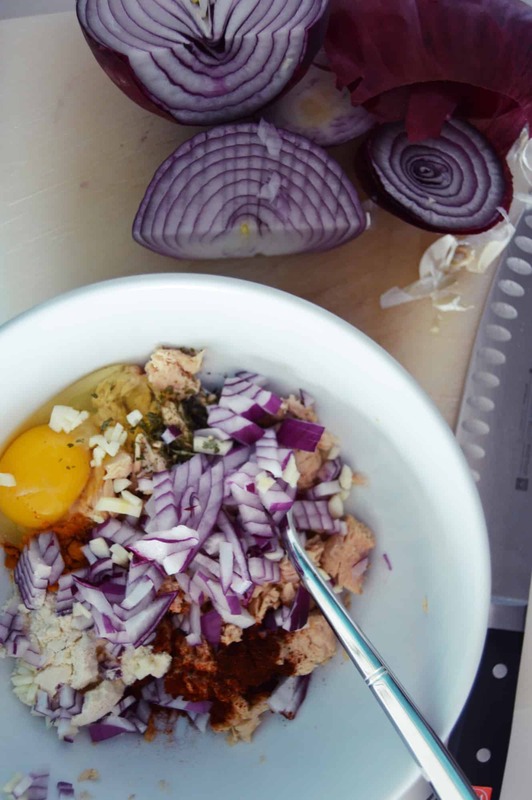 You would think that cutting out the breadcrumbs and adjusting a salmon cake to be low carb would be easy but it is harder than you may think. Those “fillers” that are in traditional salmon cakes are there for a reason, they really do help hold the cake together. Breading inside and sometimes on the outside of salmon cakes seem to make a big difference. 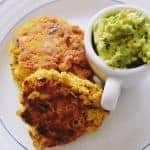 As I played with variations of salmon cakes, I kept having the same problem- the cake would crumble and I would be left with a plate of salmon pieces (while deliciously seasoned, this is not what I wanted). Finally, I found my magic ingredient…. Coconut flour! 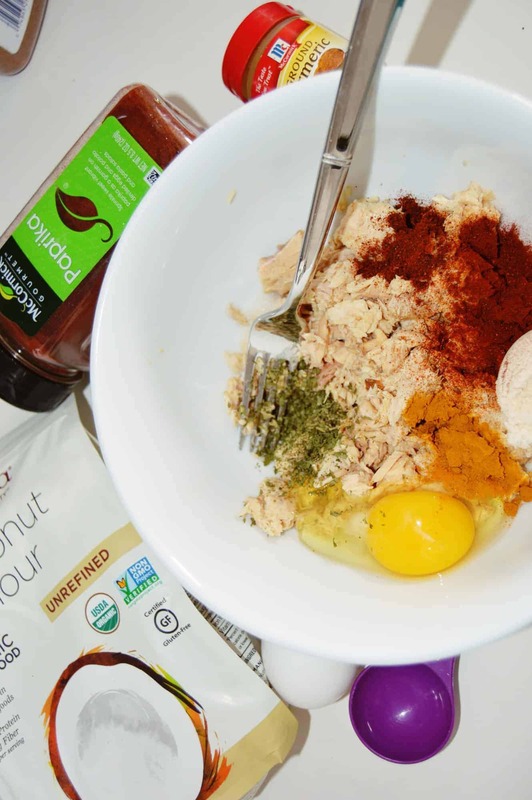 Adding coconut flour to my salmon cakes was a game-changing moment. Coconut flour is known for absorbing liquids and drying out anything is it put in. While no one wants to eat a dry salmon cake but a little coconut flour was enough to absorb some of the excess moisture and bind the cakes (with a little help from the eggs too! Don’t want to leave them out….). My texture goal was complete! My salmon cakes are delicious and moist with each cut of the fork. Mission accomplished! Of course, seasoning was also key in my salmon cake recipe development. I went with a combination of Indian inspired flavors like turmeric and cumin mixed with bright, fresh tastes like lemon juice and parsley. Kind of an Italian Indian mix (sounds like a great new fusion cuisine!). 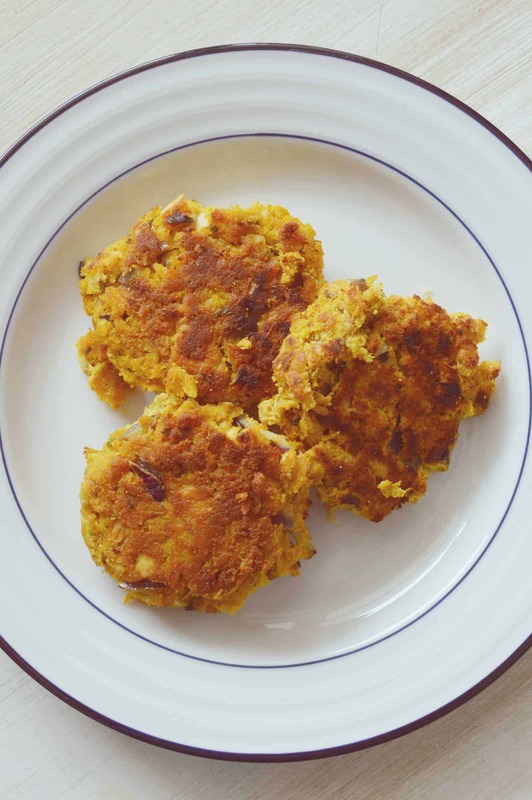 Thanks to many trial and errors with the texture, I was also to play a lot with the spices and can now guarantee that these salmon cakes are loaded with balanced flavor in every bite. So the low carb salmon cake conundrum is solved. 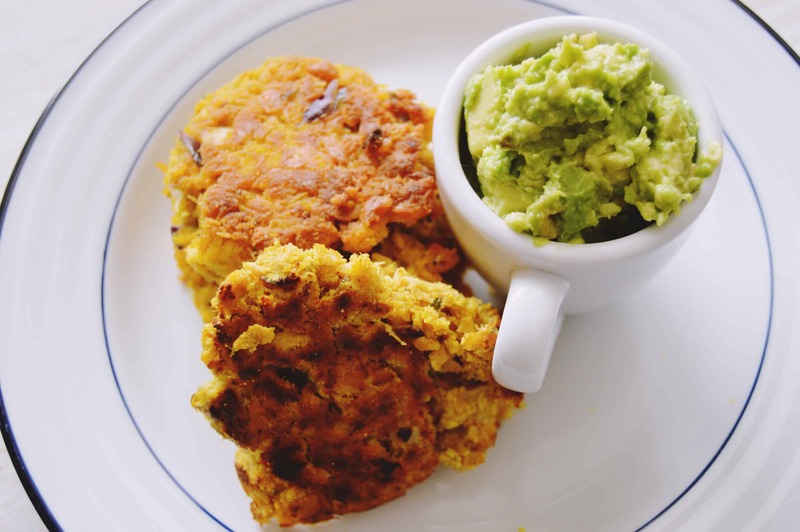 With this recipe, you will be able to have delicious salmon cakes with none of the worries about carb intake. 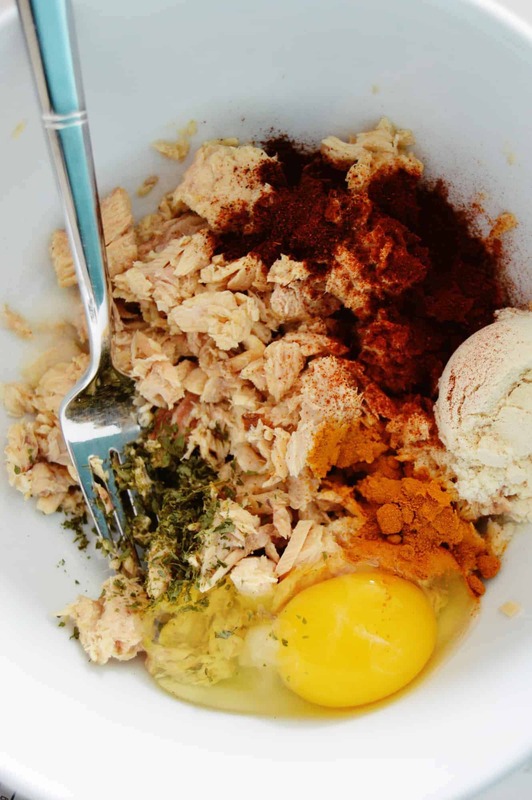 Pure flavor, easy recipe, low carb….what are you waiting for? 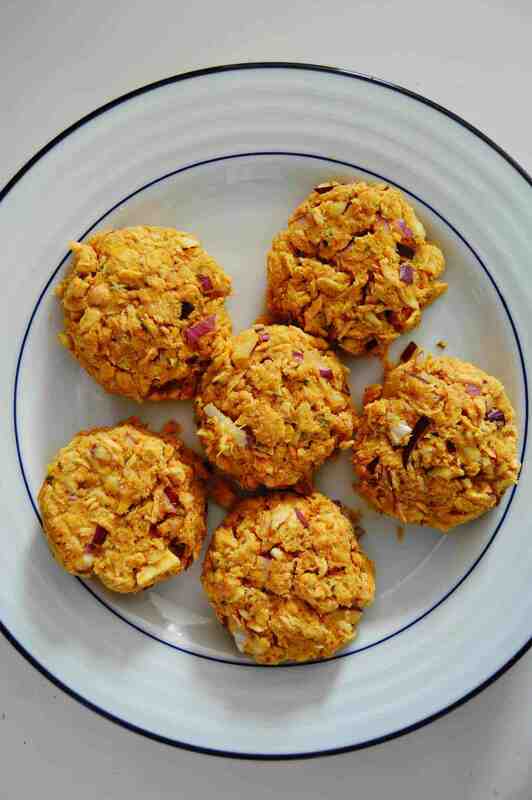 Go make these salmon cakes! Heat olive oil in a saute pan over medium heat and add the salmon cakes. Work in batches to prevent the pan from being to crowded. Cook the salmon cakes for about 4-5 minutes then flip and cook for another 4-5 minutes. Serve while hot alone or with some mashed avocado.